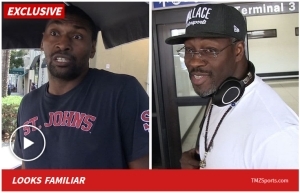 TMZ SPORTS -- Metta World Peace & Ben Wallace agree that Khabib & Conor's post-UFC 229 brawl was intense ... but neither man seems to think it was as bad as their infamous 2004 "Malice In The Palace" fight. BTW -- both these guys absolutely LOVE talking about the "Malice at the Palace." Actually, we were joking ... they really wish it would never be brought up again, but they still both ultra cool to our camera guy, so it is what it is. We got Ben at LAX (a minor miracle) and Metta out on the streets of L.A. and asked them what they thought about the whole dustup, being that they're experienced. Remember -- Ben and Metta weren't just involved in the Pacers vs. Pistons mega-fight, THEY GOT IT JUMPED OFF -- as the first two guys to go. Ben was first ... saying he's not sure 229 was worse ... but that he's rooting for it. "I hope something surpasses it, so we can stop talking about it." We got Metta next, asked him his thoughts. "It was a pretty epic fight, but there's always fights all the time." One thing that's pretty clear ... neither guy thinks there should be too stiff a penalty for the dustup, with Metta saying there should be no action by the UFC at all ... as long Khabib plays nice. "I would say, 'don't do it again,' and he won't do it again." If only David Stern would've been so cool in '04.